A trusted name in hydraulic parts and service since 1977, Bernell Hydraulics is here to help. We invite you to utilize our expert services whenever you need hydraulic equipment repair San Bernardino CA. 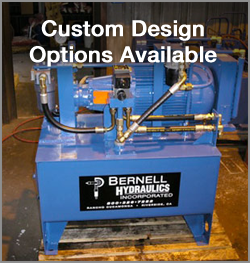 At Bernell Hydraulics, we know that your hydraulic equipment is your livelihood, and the longer it sits idle due to a mechanical problem, the worse it is for your business. We offer 24 hour mobile repair services to enable you to limit the down time suffered as a result of a broken part. Simply give us a call and we’ll send a skilled mobile tech straight to your worksite as soon as possible. With the tech’s help, your equipment will soon be up and running again. Getting hydraulic equipment repair San Bernardino CA when you need it is all well and good, but wouldn’t you rather that your parts hadn’t failed in the first place? With regular preventative maintenance, you can make great strides towards this goal. We handle all your maintenance tasks for you, including fluid top offs, fluid flushes, filter cleanings or replacements, and hose inspections. Stay ahead of the game with our preventative maintenance!